Because with the steps I will teach you, it's possible to save LOADS of money on clothes shopping online. I'm the kind of girl that never spends more than $20 for any piece of clothing... except maybe boots, a coat or other items that will last for a long time. I'm usually snagging tees & tops for less than $10 each and bottoms for less than $15. That's just how I roll. I'm a mom and stuff gets stained, torn and worn out too fast to spend very much on it. Yet I enjoy a functional, revolving and on-trend wardrobe! And if you currently believe the best deals will only be found in-store, I think this information will convince you otherwise! In part 1 below I want to share my very top-secret clothes shopping tips and tricks for saving the very most I possibly can on clothes I buy online. Another way of looking at it: how to spend the least possible on clothes. In part 2 of this blog post, I'll share some ongoing activities that can make you money before you even need anything online. Except they're not top-secret, Corina, because this is a public blog… Right. On with it then. Before jumping into the juicy list, I wanted to put in a word about shopping lists and capsule wardrobe plans. Because without them, you might save money on clothes online but in the long term you'll be wasting a lot. As a mom fighting the frumpy monster, you need vision for where you want your wardrobe to go. It will give you confidence about what to even spend money on, and you'll never regret a purchase again. 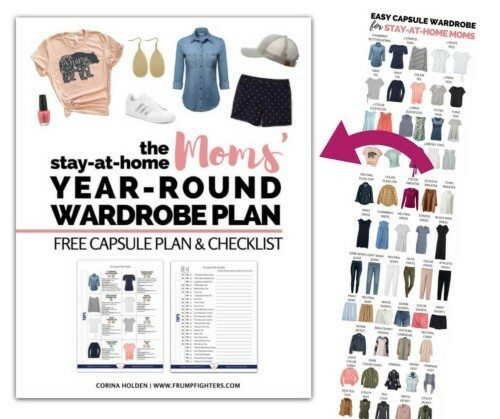 You can go here to download my capsule wardrobe checklist for moms. IMPORTANT: For max savings, stack these steps. Any one of these strategies on their own may not make much of a difference. But combine them and you’re going to be jumping out of your chair with glee after placing an order. You might even feel a little guilty because you snagged such a good deal. But I promise none of these strategies are cheating. They are all 100% legit! I like to say the best savings are achieved by not buying anything at all. ;) You don't want to spend on something if you will be unhappy and unsatisfied with your purchase later. That's like throwing money away and it would have been better never to buy it in the first place. To avoid this, maintain a shopping list for what you really need/want in your wardrobe, complete with color/texture/style descriptions to narrow items down. I go into depth about how to create a smart shopping list here and here. You can download a pre-filled shopping checklist for moms here. There is always a sale just around the corner. If you have enough patience, you will likely find that item (or a similar one) available at a fraction of the cost in the near future. Shop during holiday or special event sales. They happen all the time. Stay notified by signing up for your favorite site's newsletters and the deals will be pouring into your inbox. In fact, unless you're shopping a special event deal, I recommend starting your browsing in those sections to avoid getting wrapped up in full-price merchandise. As soon as you land on a site, filter your results by "clearance" or "sale" on the left-hand bar. When the results populate, use the "Sort" button at the top to sort by Price: Low to High. Prepare to be amazed by the deals! Look for coupons before checking out. You can use Retail Me Not, DealSpotr or the Ebates plugin on your browser (more about that below). Styling on a Budget Tip #3: Use a cashback service. Once you know which sales event or clearance you want to shop, open a shopping trip with a cashback site before placing your order. These sites will return a cut of your purchase simply for opening the "shopping trip" via their site. After trying several out, Ebates and Swagbucks are the two that I've found the easiest to use and most faithful at offering the highest cashback and easiest payout. I've recently discovered TopCashback and have been surprised by the cashback rates they offer. Often higher than Ebates! The percentage of return varies from store-to-store and season to season. Just like stores, they run special events offering double or triple cashback during holidays. Often one cashback site will offer cashback when the others don't. So check each of the ones you're signed up with before opening a shopping trip with one of them. For example: Although Ebates and Swagbucks are my go-to, at the time of this post Old Navy cashback offers were Ebates 2%, Swagbucks 4%, and TopCashback 5%. But the percentages can change daily. Here’s a comparison of the three… although I recommend signing up for all of them so you can check each for the best cashback being offered. Payout: Quarterly via a check or Paypal. Ease: Contracted with the greatest number of stores. You can install a button on your browser to notify you when you've landed on a site offering cashback. It also checks for coupons for you at check out. Sign up incentive: You get a $10 gift card on your account just for signing up! Other: Their referral system is also quite profitable. Around the time I first signed up, they were offering $75 when you referred 3 friends. I shared this with my friends, got exactly 3 sign-ups and earned a free $75. Yes you read that right. And I understand how crazy it sounds. (I'm still in shock.) But I received a check so it's true. Their referral incentives vary throughout the year but you always get at least $5 for each referral. Currently it’s $25 per referral, no limit. Payout: You accumulate "swagbucks" or "SBs" which you use to redeem gift cards. One SB = 1 penny. So 100 SB's = $1. You can redeem gift cards at any time. Sign up incentive: Bonus SB's offered occasionally. Other: There are several other ways to earn cashback through SB's. My favorite is using their search engine. I get 10-20 SB's/cents every 3rd or 4th search I do. Their algorithm decides, but I've noticed that the rewards have increased now that I've used it for a couple of years. They also have a great referral incentive. You earn 10% of your referred friends earnings for life. Sign up for TopCashback here. Payout: At any time via bank transfer or Paypal. Ease: Does not currently offer a browser plugin like Ebates and Swagbucks. But their website is easy to use to search for cashback rates on any store. Tip: When shopping online, let the browser plugins tell you what cashback rates Ebates and Swagbucks are offering, then open a second window to check rates on TopCashback. Open your shopping trip with the highest! Sign up incentive: Currently none being offered. Other: I have been pleasantly surprised to often find higher cashback rates by TopCashback than Ebates or Swagbucks. TopCashback also offers $15 for successfully referring friends (you get the $15 after your referred friends earn their first $10 in cashback). Option 1 for getting free shipping: Use a free shipping coupon code. Option 2 for getting free shipping: Group orders. Buy several things from your shopping list to reach the store's minimum purchase and get free shipping. This may be achieved if you need to order two sizes to try on. Or ask your girl friends/family if they want to add anything to your order to get free shipping too. Option 3 for getting free shipping: Ship to store. If you're shopping online for a prominent department store such as Target, Macy's, JCPenney, you can choose to "ship to store" to get free shipping. This isn't just a savings, it's also convenient because you can try the item(s) on in the fitting room when you pick them up and return them immediately without the hassle of mailing something back! Styling on a Budget Tip #5: Use your highest cashback credit card to check out. Many credit cards offer from 1-3% cashback on purchases. If you have one of these, make sure to use that credit card to maximize returns on your purchase. Don't forget to check Amazon.com for items on your list. They off incredible clothing deals in their Amazon Fashion department. Before engaging with their selection, help yourself avoid full price items by filtering results to only see the best deals. On the sidebar, choose your desired category "shoes" or "clothing" etc. Keep selecting categories until the sidebar presents an additional "refine by" section. Further refine by 4+ ratings, by your size, and choose 10%-70% discounts to only see the most high quality clothing that is discounted, ships for free and is in your size. Try it now: Go here to Amazon Fashion for Women. On the sidebar, select Clothing > Dresses. Under "refine by" choose Amazon free shipping, 4+ stars, your size, and under $25. You'll be amazed by the selection! Sign up for and install the Honey plugin on your browser. This handy little tool will tell you whether you found the best deal for this item of all the sellers on Amazon. It will also show you a chart of how the price has fluctuating over the last few weeks so that you can decide whether to purchase now or wait. And finally, it lets you set up alerts for items so that you are automatically notified when they go down in price. Sign up for Honey here. ThredUP is an online consignment store that makes it easier than ever to get paid for clothes you no longer wear. They send you a free clean out bag that you fill with your clothes (good quality and in good condition) and ship to them for free. Use their Earnings Estimator to find out what others have earned for similar pieces. ThredUP will email you and offer pay out right away for the items they keep and post on their site. You don't have to wait until your items sell (unless they are listed for $60+). They take care of everything from photographing the items to selling them. Sign up for ThredUp here and get $10 credit towards their awesome used clothing inventory. Swagbucks doesn't just offer cashback on your online purchases, they also offer several other ways to earn swagbucks. These include watching videos, playing games, and taking surveys. But my favorite "passive" way to earn a few extra swagbucks is using their search engine instead of Google. You can follow these instructions to make SB your default search engine, allowing you to search straight from your URL bar. I commonly earn 6-18 SB's (that's 6-18 cents) every few searches. It adds up! You can buy gift cards to most clothing stores with the points to then use on your purchases. Recently I noticed that my Fred Meyer mobile app was offering a discounted gift card for Old Navy by clipping their digital coupon. "Clipping" on the app sends the coupon directly to your rewards card so that the discount is applied when you check out at the store and buy a gift card. If you use a coupon app (even one that is mostly for groceries) look out for these occasional deals on gift cards! Swagbucks also runs a website (https://www.mygiftcardsplus.com) where you can get cashback for gift cards from a handful of stores. My favorites: Groupon and Old Navy. This is available year round. So if you know you'll be ordering from these stores in the future, by a gift card through this website to start rolling the savings ball! Example #1: Macy's purchase. While browsing Macy's for deals on items in my shopping list, I found a pair of white skinny jeans by Motherhood Maternity on sale for $12.72 (orig. $44.98). I ordered two sizes to try on because reviews suggested they ran big. This qualified me for free shipping during their free shipping for $25 or more promotion (alternatively I could have had it shipped to store for free shipping). I activated Ebates for 6% cashback and used my credit card with 1% cashback. That's an additional 7% savings, making my pants only cost $11.82. In fact, I had a balance on a gift card from Christmas and ended up getting them for just a few cents. Example #2: JCPenney purchase. I was also on the look out recently for a trendy vest and came a white crochet vest on JCPenney.com, on sale for $25.99 (orig. $42). I used a 25% off coupon they were promoting for another $6.25 off and activated Ebates for 15% cashback—another $2.81 in savings. Using my 1% cashback credit card I paid $18.55, saving $23.45 (56%) total. I also got free shipping by shipping it to store. Here is a snapshot of my browser when I visited JCPenney online at the time of this post. And below below it are the checklist items you would use to get the best discount on clothes on that day. Notice that the Swagbucks and Ebates browser plugins automatically populated along the top. I then checked TopCashback which was also offering 3% like Ebates. Swagbucks is the highest bidder today! Shop Sale/Clearance: Hover over Clearance tab and navigate to desired category. Further filter by item type or desired price range on the side bar. Sort by "price low to high" to see the best deals first. Prepare to be amazed. Coupon: 15% off online orders "24SHOP" or "EBATES15"
I hope this example helps bring the steps to life. But please let me know if you have any questions! It can be easy to forget one of these steps to saving as you shop online. I've missed one or two savings steps more times than I'd like and kicked myself for days afterward. To help insure you never miss any savings on your online purchases, I've put together a handy checklist that you can print and keep by your computer (or snap a picture on your mobile to keep handy in the gallery). This checklist includes an "ongoing activities" section to remind you how you can be strategizing and even making money to spend on future purchases. It also includes the checklist of savings steps for when you're ready to order something, organized in the progression you would actually implement them. Click here to get your password and download this PDF! You'll forever have exclusive access to my library of free printables. If you're already a subscriber, you can download it here. Password is at the bottom of the last newsletter you received. Did I miss any great tips? Let me know in the comments below!